The aim of this paper is to analyze methodological problems of cross-cultural research in experimental philosophy. By studying five research projects, representing two distinct approaches to the examination of cross-cultural differences in philosophical intuitions, I point out the difficulties related to the content validity that appear in the choice of some cultural affiliation indicators. I criticize various indicators of cultural affiliation that are used in experimental philosophy (selfidentification, language) and suggest which indicators, and how, should be chosen in that kind of research. I also argue that some problems related to bilingualism, translation, and the possible influence of language on the owned or reported philosophical intuitions may be impossible to transcend in cross-cultural research in experimental philosophy. It may be impossible to assess the differences between cultural philosophical intuitions. Abarbanell L., Hauser M. (2010), Mayan Morality. An Exploration of Permissible Harms, "Cognition" 115(2), 207-224. Auer P. (1998), Code-Switching in Conversation, London: Routledge. Bar-On D. (1994), Conceptual Relativism and Translation [w:] Language, Mind and Epistemology, J. Hintikka (ed. ), Dordrecht: Springer, 145-170. Cappelen H. (2014), X-Phi without Intuitions [w:] Intuitions, A. Booth, D. Rowbottom (eds. ), Oxford: Oxford University Press, 269-286. Durkheim E. (1912/1990), Elementarne formy życia religijnego. System totemiczny w Australii, tłum. A. Zadrożyńska, Warszawa: Wydawnictwo Naukowe PWN. Habermas J. 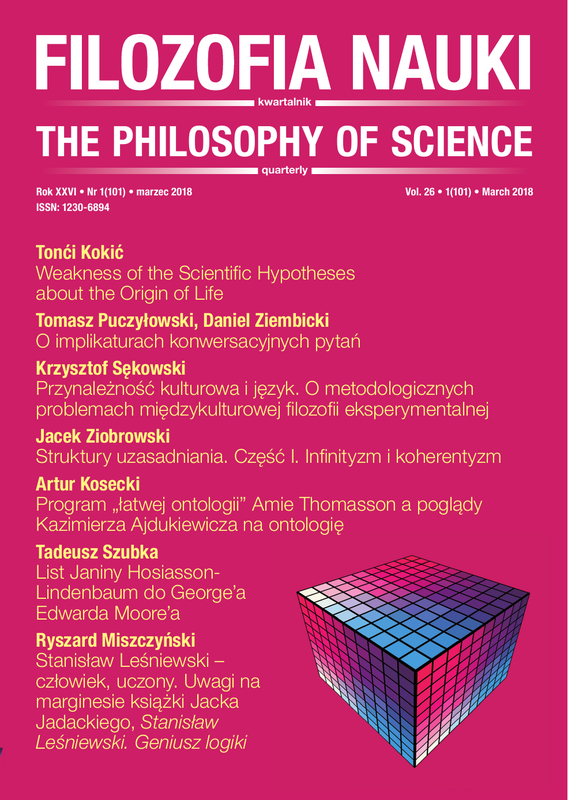 (1981/2002), Teoria działania komunikacyjnego, t. II, Przyczynek do krytyki rozumu funkcjonalnego, tłum. A. M. Kaniowski, Warszawa: Wydawnictwo Naukowe PWN. Kauppinen A. (2007), The Rise and Fall of Experimental Philosophy, "Philosophical Explorations" 10(2), 95-118. Kerr E. T. (2015), Epistemological Experiments and Empirical Philosophy in Cross-Cultural Contexts, "Asia Research Institute Working Paper Series" 233, 1-27. Kim M., Yuan Y. (2016), Cross-Cultural Universality in Knowledge Attributions, goo.gl/6YR73E. Kurzban, R. (2012), Why Everyone (Else) is a Hypocrite. Evolution and the Modular Mind, Princeton: Princeton University Press. Kuś K., Maćkiewicz B. (2016), Z rozmysłem, ale nie specjalnie. O językowej wrażliwości filozofii eksperymentalnej, "Filozofia Nauki" 24(3) , 73-101. Michna E. (2004), Etyczny wymiar tożsamości etnicznej w sytuacji zmiany identyfikacji narodowej [w:] Etyczny wymiar tożsamości kulturowej, M. Flis (red. ), Kraków: Nomos, 25-45. Myers-Scotton C. (1993), Social Motivations for Codeswitching. Evidence from Africa, Oxford: Clarendon. Pinker S. (1995), The Language Instinct. How the Mind Creates Language, New York: Harper Perennial. Romaniszyn K. (2004), Konsumuję więc jestem? [w:] Etyczny wymiar tożsamości kulturowej, M. Flis (red. ), Kraków: Nomos, 37-48. Sztompka P. (2002), Socjologia. Analiza społeczeństwa, Kraków: Znak. Tambor J. (2010), Kulturowe wyznaczniki tożsamości. Tożsamość mieszkańców województwa śląskiego, https://goo.gl/RrGtDL. Turri J. (2013), A Conspicuous Art. Putting Gettier to the Test, "Philosophers' Imprint" 13(10), 1-16. Williamson T. (2016), Philosophical Criticisms of Experimental Philosophy [w:] A Companion to Experimental Philosophy, J. Sytsma, W. Buckwalter (eds. ), Chichester: Wiley, 22-26. Woolard K. (2004), Codeswitching [w:] A Companion to Linguistic Anthropology, A. Duranti (ed. ), Malden, MA: Blackwell, 73-94.